The book is a study of khadi, the fabric that successfully transcended its commodity status to become a political symbol. Khadi was not just a symbol; it was a massive exercise in organisational establishment, in forging networks, brand- building, and ideological investment. Using a fresh and imaginative approach, the book shows how an idea, determinedly pursued, can become a movement. 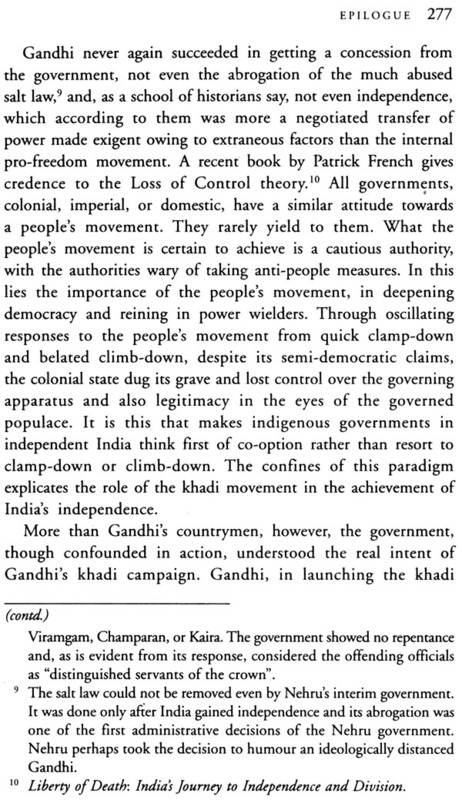 It also argues that simplicity as advocated by the khadi movement can be subversive and revolutionary. 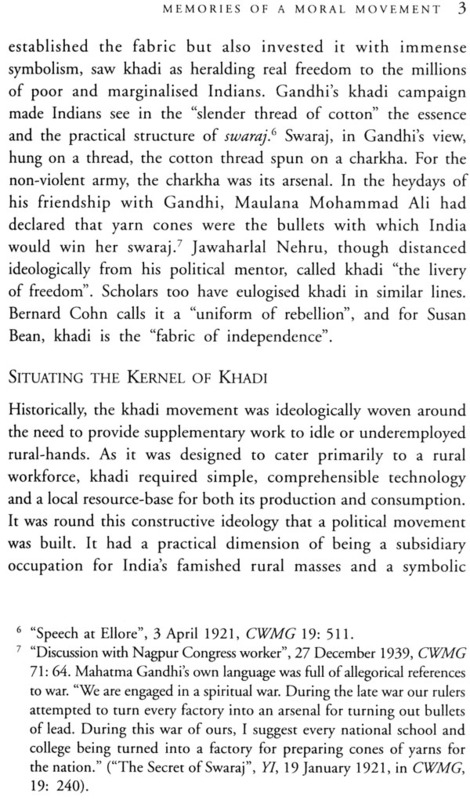 Khadi acquired emblematic status during India’s freedom struggle. Gandhi, largely acknowledged as the one who pioneered the fabric and invested it with symbolism, saw khadi as heralding real freedom to the millions of poor and marginalised Indians. 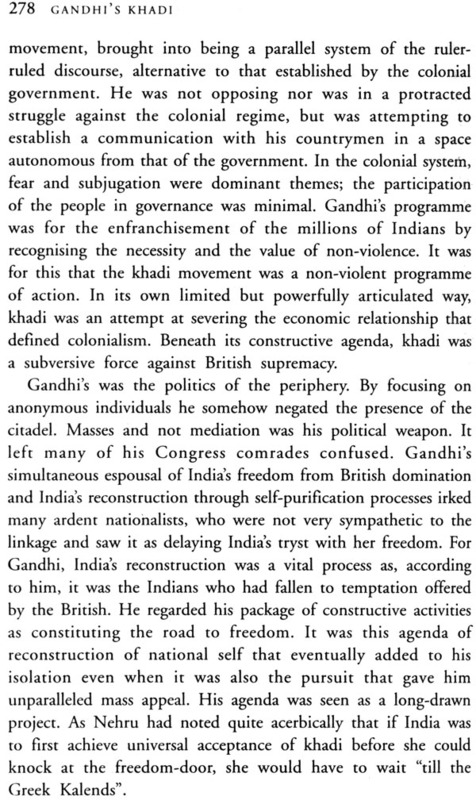 Bringing a peripheral academic concern to its rightful centrality, the book analyses how Gandhi’s aggressive khadi campaign was meant to clearly separate Indians across a sartorial divide between those who clung to self-interest and, by extension, loyalty to British imperialism, and those who acted for social well-being. 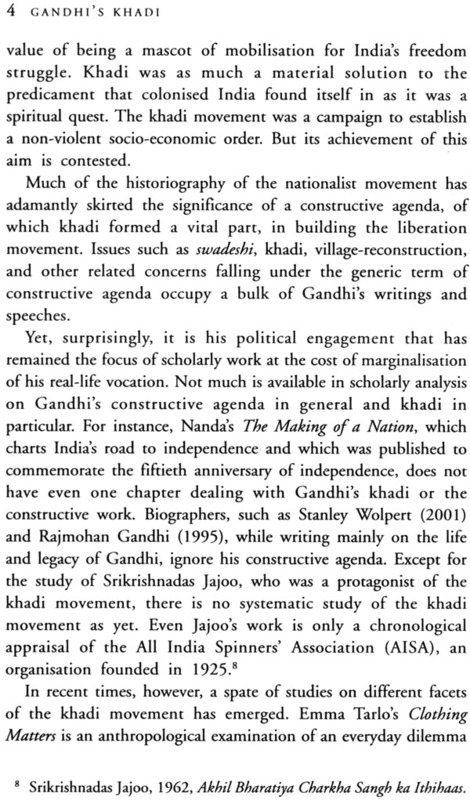 Recreating a parallel history of the khadi movement alongside that of India’s freedom struggle, Ramagundam argues that khadi’s core semiotic lay in its being a commodity of resistance against colonial exploitation. Focusing on the khadi movement, the book seeks to widen the academic debate on the forces leading to India’s independence. Rahul Ramagundam has a Ph.D from Jawaharlal Nehru University. He has been engaged with grassroots issues as an activist, advocate and academic. His publications include Defeated Innocence: Adivasi Assertion, Land Rights and the Ekta Parishad Movement (200 1) and Pausing Poverty: Gaya in Bihar (2006). His articles have been published in journals such as the Economic and Political Weekly and in national newspapers. Currently, he is writing the history of voluntarism in India and adapting to the medium of documentary-film making to communicate his larger concerns. My formative years were spent with my paternal grandparents. They were first-generation migrants from a rural area to an urban location, part of Nehru’s modern India that had burgeoning public sector units with townships for its workers. 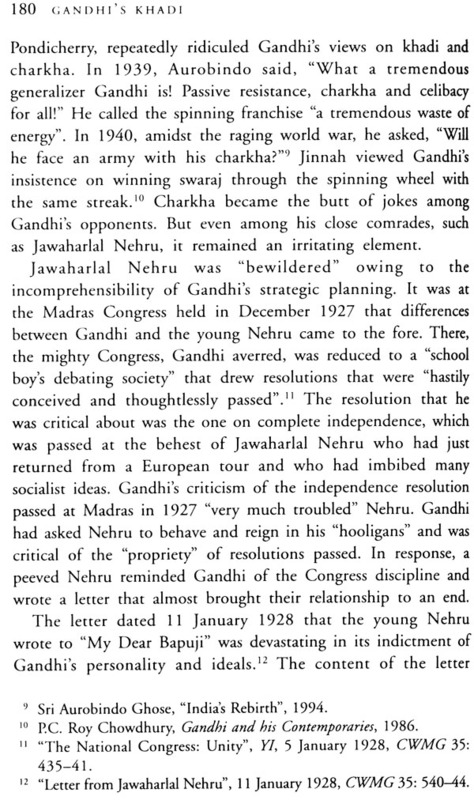 While my grandparents benefited materially from Nehru’s developmental model, their thinking and habits were drawn from Gandhian idealism. They were simple people. And they always wore khadi. I remember my grandfather going to his workplace in khadi dhoti and kurta with an angavastram wrapped around his neck and a Gandhi topi on his head; he looked resplendent and fashionable. My grandmother didn’t speak any language other than her own rural dialect and yet never felt incomplete in any way. She was tiny and tenacious, confident and cautious. She could write only two words: one, Sitaram, which while being an invocation of the name of God was also her husband’s name. The other word was her own name Arti, which she sometimes had to write when my grandfather brought some bank papers for her to sign. She wrote “Sitaram” repetitively in discarded old diaries and asked her relatives, if someone happened to go anywhere near the Ganges, to immerse them in the sacred river. Her illiteracy however never deadened her sensitivity or fanaticised her religiosity. She was pained as she watched the demolition of Babri masjid in December 1992 on television. She was a highly religious woman who would keep many fasts and worship many gods. Every morning, after her bath, she would stand in the courtyard before a tulsi plant, with folded hands, and invoke Sirrya to bring happiness, first to each and every one in the universe and then, lastly, to her family and herself. 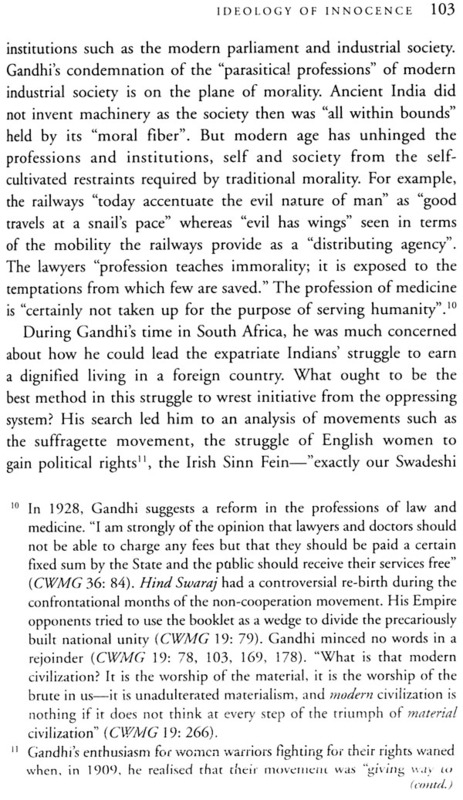 Her material and moral sustenance came from two sources: the material from Nehru’s confident India and the moral from Gandhi’s ethics. This book is a tribute to the memory of my grandparents, habitual khadi wearers, who now departed, had sown the seeds of this work by their cultural convictions and material aspirations. Some sixty years after it was wrapped up as a non-violent voluntary movement that transformed a commodity into a political symbol of assertion and autonomy, this interpretive history of the khadi movement is being written. In this time, khadi was appropriated by the newly independent state as one of its “developmental departments”. This time-frame is important because it shows the apathy with which khadi, its ideology and its history were seen by India’s state architects and development thinkers. But more than intellectual apathy, the absence of a serious, policy-oriented assessment of Gandhian socio-economic practices shows some deeper symptoms of the malaise in the making of the state and its priorities in India. Khadi, ironically, in its own lifetime as a movement, had lost its sheen and had been declared as an “old man’s fad” bound to vanish along with his mortal remains. 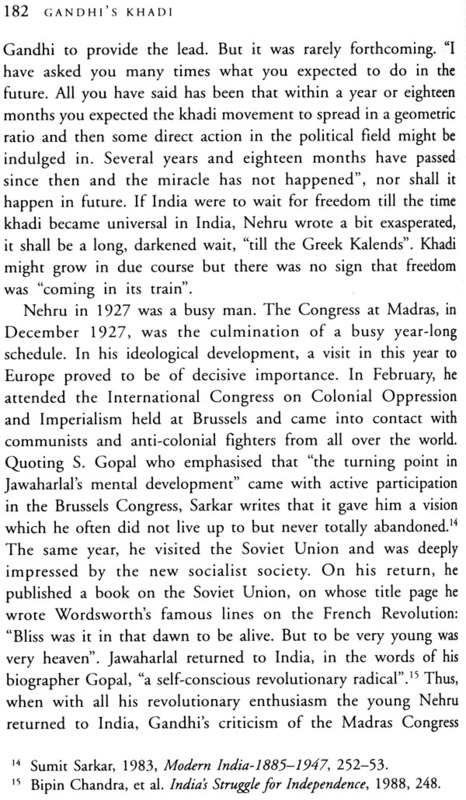 “The East India Company”, Gandhi said to Katherine Mayo on 17 March 1926, “came to buy, and remained to sell. It compelled us to cut off our thumbs. This is the history of how our skill was lost.” The khadi movement was an attempt at reclaming a lost skill in a restricted colonial environment. It was a massive voluntary exercise. 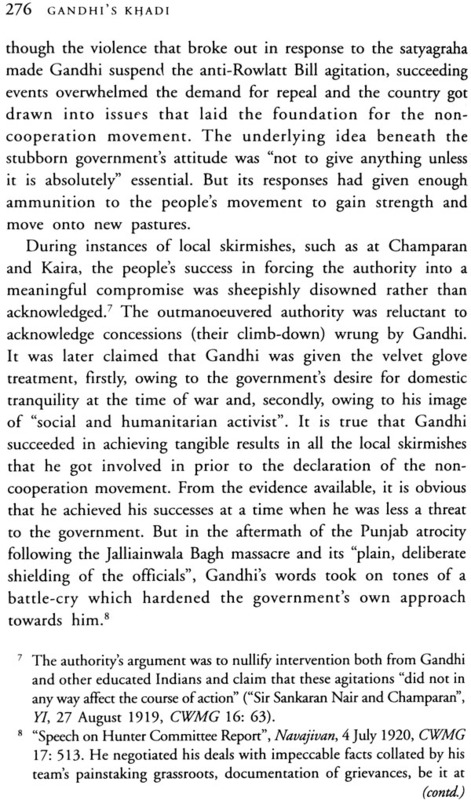 However, Gandhi’s critics, including established Congress politicians, saw his effort as a futile attempt at revivalism. 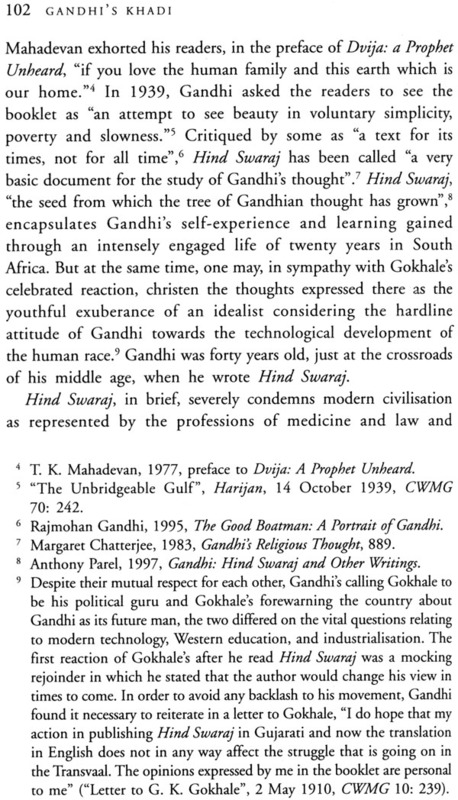 Gandhian ideology was perceived as “religiously oriented, backward-looking”. I began to look at the khadi movement with a curiosity to discover elements of an alternative development model. But as the research progressed, I discovered newer strands. I realised how massively it was organised on a nationwide scale. 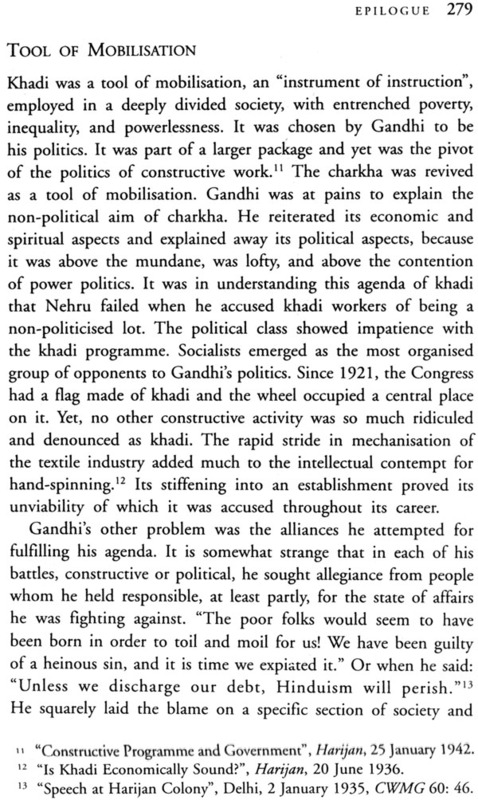 I also discovered the almost continuous ideological contestation that the khadi movement witnessed as Gandhi and his close followers determinedly pursued it. 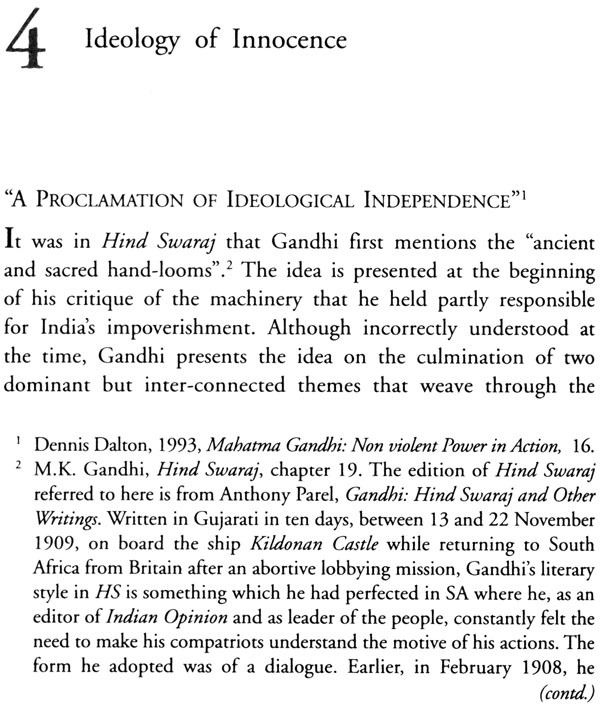 But the most important discovery was its importance in Gandhi’s attempt to establish self-rule for the “dumb-millions”. 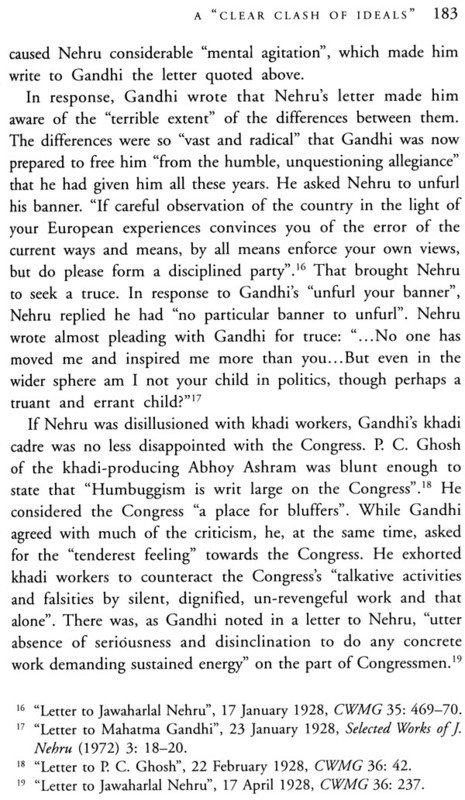 In many ways, khadi was central to the conversion of the Congress into a mass-based organisation. 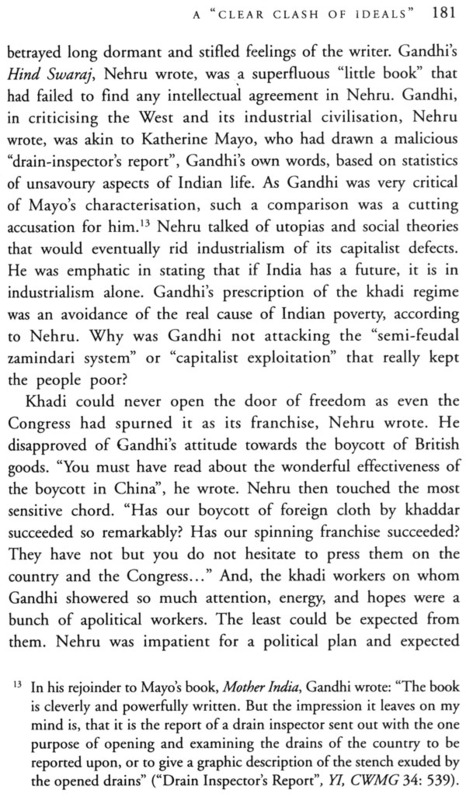 And, yet the Congress was most vehemently opposed to khadi’s occupying a central position in the struggle for freedom. The second-hand set of the 90 volumes of the Collected Works of Mahatma Gandhi that Delhi’s Gandhi Peace Foundation (GPF) was about to sell to a junk dealer in the winter of 1995, which I bought at the princely sum of five hundred rupees, became the backbone of this work. The book is equally informed by my grassroots engagements, to which Raj ago pal, the then Secretary of the GPF, introduced me. During 1995 to 2001, while studying at JNU, I was simultaneously engaged with grassroots activism on the livelihood rights of the adivasi people in Madhya Pradesh. Those years lent me the perspective to look at Gandhi’s khadi movement, which in many substantive ways was the first social movement in modern India that brought poverty to the centre stage of Indian consciousness and made livelihood rights an issue of mass mobilisation. This book, in the making as it was for the last ten years, has incurred many debts and belongs primarily to the friends whose unstinted support and unwavering affection helped realise this dream. Akhilesh Kumar, Saral Ganguli, Sob ha Tiwari, and Samskruti were some of those friends who supported this long drawn academic struggle with their faith, love and understanding. 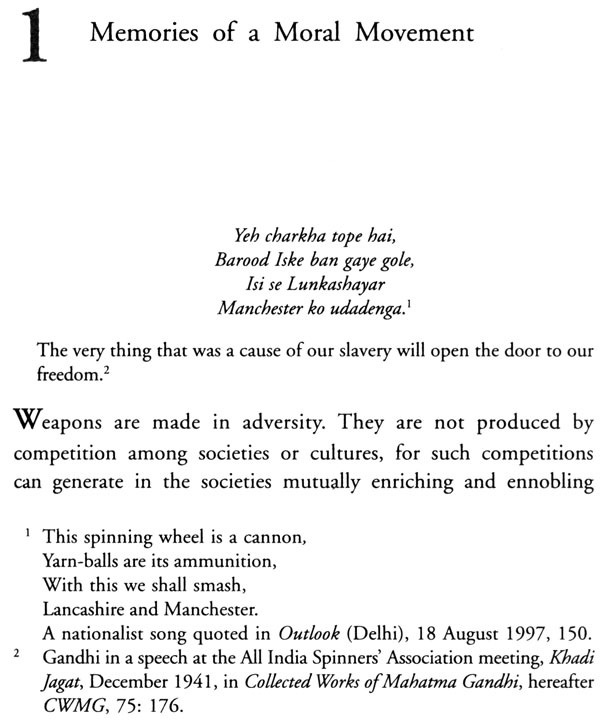 Samskruti’s irreverent questioning enriched many ideological and narrative enunciations. I feel deeply for Malay, with whom it all began, and Mamsi, who provided vital support as it progressed; unfortunately their patience ran out before the dream had run its full course. But for my parents, Mithelesh and Nitya Nand Singh, whose love and affirmation were my strength, this work would not have been possible. They put their aspirations on hold to let me complete this work. My brothers Niraj and Rajiv have been pillars of strength. Professor Bhagwan Josh guided my Ph.D. at the Centre for Historical Studies, JNU. He was affectionate, and friendly all through the research engagement; his inputs added sharpness to my ideas and enriched the arguments. Adirya Mukherjee, as the supervisor of my M. Phil dissertation, read its very first draft. Ramachandra Guha, Deepak Kumar, Mridula Mukherjee, Biswamoy Pati, Mahesh Rangarajan, Qamar Aga, Salil Mishra, Sub rat Rout and Dunu Roy have influenced the evolution of this work by their friendship, encouragement and critical engagement. My association with Pitamabar Bhatt of the KYlC, which gave me some financial support to undertake empirical research on khadi-producing institutions in Bihar and Haryana; Ragini Prem of the Banwasi Sewa Ashram; Y.P. Anand, the director of the National Gandhi Museum; late Som Bhai and Jailok Thakur, institutions in themselves in the khadi sectors of Haryana and Bihar, respectively, and many others were vital preparatory ground when I began to explore archival sources. 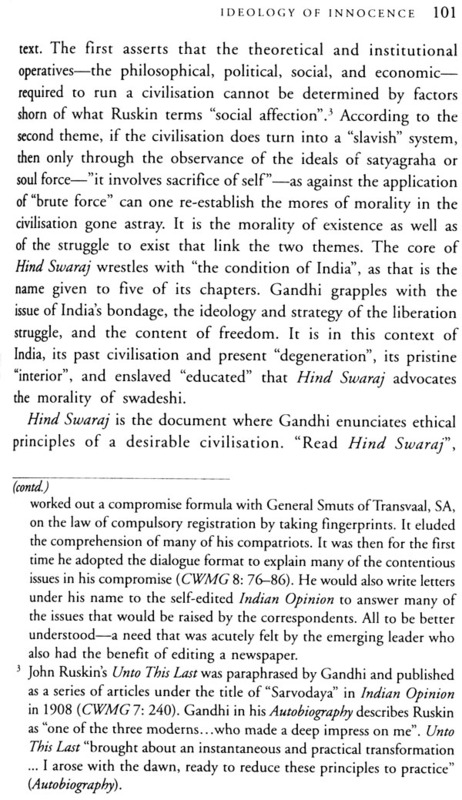 With gratitude I acknowledge contributions of libraries at JNU, GPF, Teen Murti, National Gandhi Museum in Delhi, Sabarmati Ashram at Ahmedabad, and the Sarva Sewa Sangh at Wardha. My thanks to the reviewer of the manuscript for his helpful suggestions all of which have been incorporated. My deep gratitude to my publishers, Orient Longman, Delhi, for their inputs. Certainly, in this long engagement, I have incurred many more debts than I have mentioned. 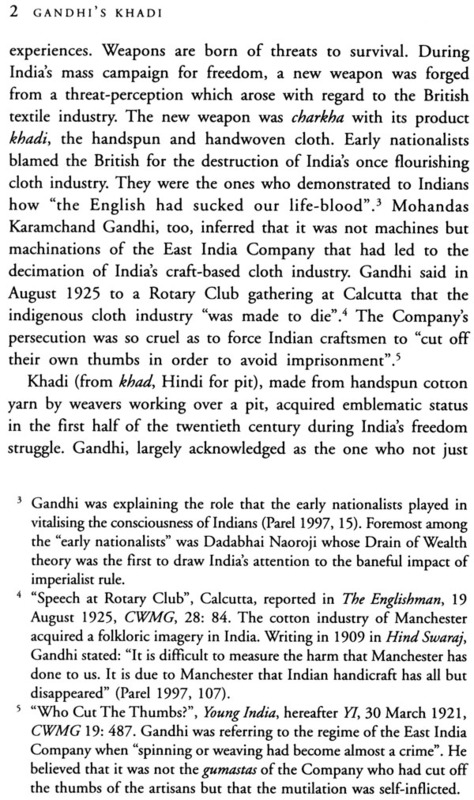 Margaret Chatterjee wrote in from Westminister College, Oxford: “a Ph.D. thesis on Khadi! I do not think Ph.D. level work would be worthwhile on it”. It was an academic challenge to prove that the project was well worthwhile, viable, and much more.